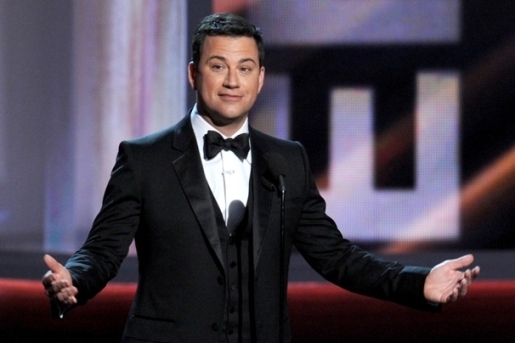 Jimmy Kimmel hosting the 2012 Primetime Emmy Awards. It wasn’t all just fun and pranks yesterday at the 2012 edition of the Primetime Emmy Awards, someone also gave out awards. A lot of awards, too. As usual, paid cable dominated the Emmys, with HBO and Showtime leading the way for the cable awards winners and CBS picking up a respectable amount of statues for the network division of contenders. The Showtime show Homeland dominated the 2012 Emmys, winning Best Drama, Best Actor in a Drama, Best Actress in a Drama, and Writing, Drama. On the comedy side, it was ABC’s runaway hit Modern Family sweeping comedy awards for Supporting Actor, Supporting Actress, and Directing. Here’s the full 2012 Emmy winners list. Once again, Game of Thrones got ripped off. I know Peter Dinklage can’t win every year, but I continue to beat the drum for Game of Thrones as the best television show on the air. Not that Homeland is a terrible show or anything, but this is a world in which Modern Family wins all the awards ever, and in which Jon Cryer has two Emmys. We can’t get a supporting actor win for Lena Headey or Charles Dance or Maisie Williams, despite brilliant work this year from all of the above? Still, Maggie Smith, Aaron Paul, Jessica Lange, and Louis CK all won, so it’s not ALL bad this year.